All Consortium schools require students to complete academic tasks to demonstrate college and career readiness and to qualify for graduation. In some classes, the tasks are crafted by the teacher, and in other instances, by the student. All graduation-level tasks, like the literature one shown below, are evaluated using the Consortium rubrics. The student will write a well-developed literary analysis, using a text of appropriate complexity and showing connections between the text and other substantial issues, such as a larger issue or theme, another work of literature, the historical or biographical context, a filmed version of the text, or noted works of relevant criticism. The paper is organized around a compelling argument and thesis, uses relevant evidence and quotations that support the argument, and provides meaningful interpretation of texts. In addition to demonstrating accepted conventions for writing, the paper also has evidence of a student’s voice and style. Each student also presents orally, either defending the paper or by demonstrating ability to adapt skills to a new text, which the student has read independently. 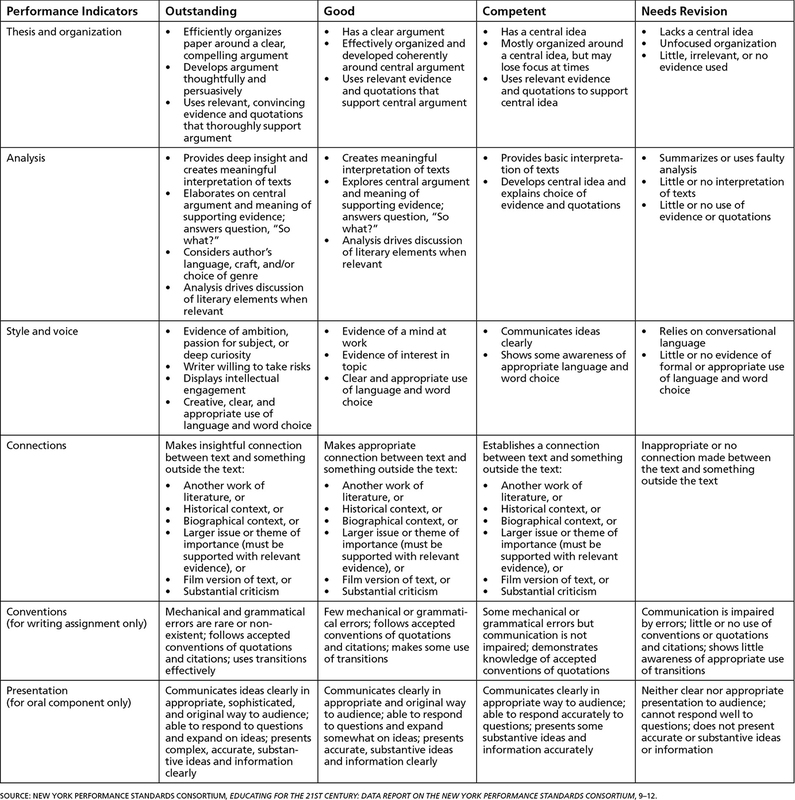 External evaluators assess both written and oral work using the Consortium rubric for a literary analysis shown below.